Increased obesity and insulin resistance in 4E-BP1 and 4E-BP2 DKO mice. 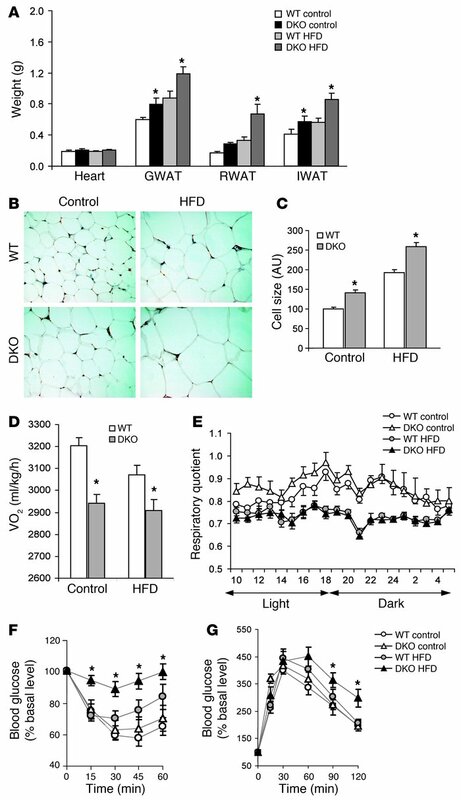 (A) Weight of the heart, gonadal (GWAT), retroperitoneal (RWAT), and inguinal (IWAT) white adipose tissue (n = 7–10) of WT and DKO mice fed HFD or normal chow diet (control). (B) Histological analysis of WT and DKO gonadal white adipose tissue from mice fed normal chow or HFD. Sections obtained from 4 different animals were stained with hematoxylin and eosin. Original magnification, ×400. (C) Adipocyte cell size in WT and DKO gonadal adipose tissue. (D) Mean VO2 in WT and DKO mice fed normal chow or HFD (n = 5). (E) Respiratory quotient, calculated as the ratio of VO2 to carbon dioxide production, in WT and DKO mice fed normal chow or HFD during light and dark phases. (F) Insulin resistance test. Fed mice given normal chow or HFD received an intraperitoneal injection of 0.75 U/kg insulin, and blood samples were taken at the indicated times (n = 7–14). (G) Glucose tolerance test. Mice fed normal chow or HFD were fasted overnight before receiving an intraperitoneal injection of 2 g/kg glucose, and blood samples were taken at the indicated times (n = 7–14). Data are mean ± SEM. *P < 0.05 versus WT (2-tailed, unpaired Student’s t test).